Utilizing straps, this exercise allows complete focus on the lower abdominals. 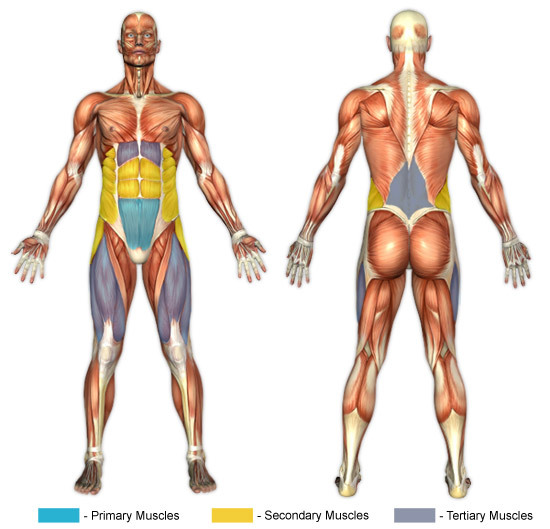 When the lift reaches a certain point, the spinal erectors also become involved in the process. With the arm straps securely anchored, place arms into the straps. Lower the arms until they are resting in the straps. The straps are ideally positioned above the elbow and slightly into the arm pit. Gently put your hands on the hanging part of the straps. Do not grip the straps tightly, this can relieve stress from the abs. Hang your legs straight down. (Do not bend at the knees with your feet behind you as this can cause lower back strain). Keep the straps parallel to the ground, slowly bring the legs to a minimum of being parallel with the ground, rounding the back to achieve optimal abdominal recruitment, and exhale throughout the movement. Hold this position briefly (1-2 seconds per repetition). Slowly bring the legs back down to the starting position, inhaling throughout the movement. It is easy to get into a swinging motion with this exercise but imperative that control is maintained throughout. Do not grip the straps more than necessary to remain secure, as this may recruit the arms into the lifting motion thereby reducing abdominal stress. Placing the hands on the straps is the best way to control the motion. Do this by placing your palms in towards you; it is ok to have a slight push on the straps but do not push so hard that it takes away from the abdominals doing the lifting. Exercises involving the abdominal core (particularly the rectus abdominis) call for rounding the back. Indeed, this is likely contrary to advice that you have heard for weight lifting in general, but in the case of exercises that focus on the aforementioned muscle group, rounding the back is recommended to prevent injury. Allowing the feet to go behind the body lends itself to swinging motions. Keep the feet in front of the body. This exercise can also put strain on the lower back region. It is recommended to stretch the lower back before and after this exercise. If the lower back strain is too much, try bending the knees very slightly as this will take some of the strain off the back by placing more on the serratus.